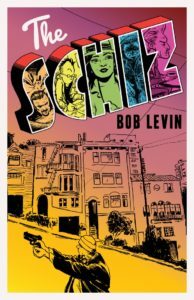 The Schiz | The Bob Levin Dot Com. Spruce Hill Books is proud to announce that it has partnered with Alternative for distribution to North American bookstores via Consortium Book Sales & Distribution and to comics specialty stores everywhere via Diamond. Look for it at your coolest local bookstore in November. Princeton Gutkin finds himself coasting on the fumes of what was once a vibrant legal career into bankruptcy and what he fears is the Black Friday of his May-December romance with his live-in girlfriend. Princeton just needs one big score to turn his luck around …. Tisa Rio knows she’s the only good thing Princeton has left, but that’s no reason to put her own life on hold … if she knew what that life should be. Dr. Morgan Beaujack may not be a doctor anymore, but that doesn’t mean he can’t practice the art of sadomasochistic sexual healing until he gets his license back. Stanley Doone is waiting for his open-and-shut lawsuit’s settlement, sure to be so massive that he’ll finally be able to draw The Great American Graphic Novel and transform society forever … if he can ever get his lawyer Princeton on the phone again to find out where his money is. Jerome Heavens doesn’t really have a home but he does own a dead man’s pistol, a Walkman, some Thelonious Monk cassettes and all the bullets and rage he needs to find the surgeon who intentionally installed a whistle in his heart, so that he look that man … in the eye. In tribute to the patron saint of Bay Area misfits, 10% of each copy of this book sold will be donated to the S. Clay Wilson Special Needs Trust. Pre-order your copy now — $15.99, plus $5 for postage in the USA. Please contact us for international shipping.